Whilest adding the RequestBuffer definitions directly to the existing httpd.rc file was OK for the purposes of experimentation it is not a good habit to get into. If we keep lobbing everything into httpd.rc before very long it will have turned into an impenetrable “wall of code”. We need to place sets of related definitions in separate files and then specify that they are part of the crate. A crate comprises an anonymous module and the items it contains. These items are defined in the crate file. The items in the crate file can include module items. A module item defines a module nested within the anonymous top-level module of the crate. A module item can define a module and the items it contains explicitly or it can reference a module contained in another file. By default this identifies the module contained in a file of the same name with the suffix “.rs”. A Rust source file implicitly defines a module which contains all the items within that file. When specified as part of a crate the name of the implicitly defined module is determined by the module item in the crate file which references it. We effectively have two sets of items which we can move into separate files. 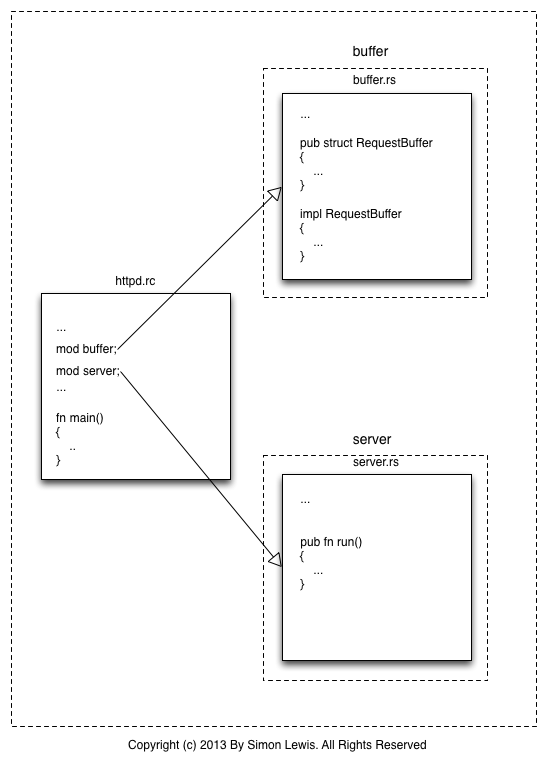 We need to make the RequestBuffer struct and the static method new and the method readLine public so they can be accessed from outside the module. . In httpd.rc nearly everything has gone. We are going to hang on the IPV4_LOOPBACK and PORT static items so we can pass them to the function server::run which we are going to invoke from our new main function. I discovered quite inadvertently that it is not actually necessary to make the RequestBuffer type public explicitly. The implementation seems to do this implicitly. This behaviour does not seem to be documented. We need somewhere to call the listen function from. There are a couple of ways to define one of these. In Rust terminology an executable is a crate. The Rust compiler takes a single crate in source form and from it produces a single crate in binary form. The source which defines a crate is contained in a single file, the crate file. A crate in binary form can be either an executable or a library. A crate file specifies which other crates containing libraries, if any, the crate being defined should be linked against. Every crate is automatically linked against the crate containing the core library. In our case we also need to link against the crate containing the std library. This is an example of an extern_mod_decl which is a kind of view_item. The result of the compilation is an executable called httpd. and the program waits for a connection. At the moment we have a couple of integer constants sitting in the middle of the code which as everyone knows is bad, bad, bad. These are both examples of a static_item. Like other items, static_items are processed at compile time and the values they define are stored in the program’s static memory. We also have a string literal in the middle of the code. In fact the string literal is already a constant stored in static memory. What we are defining here is a borrowed pointer. is a named lifetime and it tells the compiler how long we want to borrow the pointer for. Given the context I am not sure why the compiler cannot infer the required lifetime, but it doesn’t, so you have to tell it or it gets upset. A Rust module defines both a namespace and an access-control boundary. the type FlatFish could be referenced from within the fish module using the identifier FlatFish. However it is not visible outside the module. To make it visible it is necessary to make it public it like this. The FlatFish type can now be referenced from other modules. Now the local name FlatFish can be used to reference the name FlatFish in the fish module. You can also bind the name of a module locally, but visibility constraints apply to modules as well. because the fish module is not public. This is useful if you want to use a prefix to qualify a name either to avoid name clashes and/or to identify where the name is from, but you do not want to use its path because of its length. Now the local name ff can be used to reference the name FlatFish in the fish module. as enum types and modules. The effect of doing this is that the local name is now visible outside the module and it in turn can now be referenced using its path and bound to a local name in another module and so on. to reference the FlatFish type. and the local name FlatFish will reference the FlatFish type. Using aliasing in conjunction with a public name binding it is possible to re-name things in very confusing ways if you choose to do so. references the OtherFish type in the fish module.